We are the established manufacturer and supplier of a high quality Wheel Type Flow Indicator that is manufactured in adherence to the set industry standards. Resistant to abrasion, it is highly durable in its features. 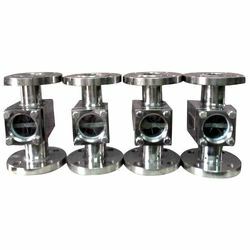 The whole range of the supreme quality wheel type flow indicators offered by us is highly regarded for its dimensional accuracy, long lasting life and easy installation. Looking for Wheel Type Flow Indicator ?